With the launch of the street-brawler MT-15, Yamaha has introduced its most performance-oriented sub-200cc naked motorcycle in India. While the MT-15 is essentially a stripped-down version of the familiar R15 V3.0, it features different styling elements and offers a more comfortable riding stance as compared to the R15's racy and aggressive stance, which, frankly, was a pain in everyday use. In terms of competition, though, the MT-15 clearly punches above its weight, owing to Yamaha's extravagant pricing habit. 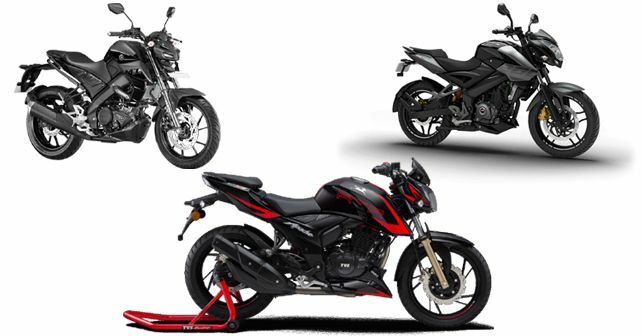 At this price point, the MT-15 can be easily compared to the TVS Apache RTR 200 4V and the Bajaj Pulsar RS200. Let's take a look at how the MT-15 fares against its rivals. At 2,020mm in length, the MT-15 is just a shade longer than the NS200 but considerably smaller than the Apache RTR 200. However, the MT-15 is the shortest out of the three at 1,070mm and also has the smallest wheelbase. At 810mm, the seat height of the MT-15 remains the highest (although the same figure for the NS200 can't be confirmed), meaning that some riders might find themselves seated a bit too high and feel less confident during turns. However, at 138kg, the MT-15 is the lightest of the three, which will surely make it the most nimble and easier to handle in everyday conditions. One aspect where the MT-15 might cause some issues is its low ground clearance of 155mm, which might cause the rear suspension mount to scrape those intimidating speed breakers. Owing to the smallest engine capacity out of the three, the MT-15 has the lowest power output of 19bhp. However, Yamaha has updated the engine mapping on the MT-15 (over the R15) to give it better low-end performance, meaning that it’ll be eager and peppy while pottering through everyday traffic. While the Pulsar NS200 is the only bike here not available with a FI version, it shares a common trait with the MT-15 – a six-speed gearbox, which allows for better performance extraction. Where the Apache and Pulsar offer a rear monoshock setup, the MT-15 offers a rudimentary swingarm layout. This might just take away some of its sporty credentials. In the ABS game, the Apache emerges a clear winner, as it is the only bike here that offers a dual-channel ABS. However, the MT-15 goes toe-to-toe with the Apache in terms of offering a fully-digital instrument cluster with a gear shift indicator. The MT-15, however, trumps its other two rivals in terms of modern styling equipment and extra utility, which comes in the form of full-LED lighting and a USB charging port for added convenience, respectively.